MUNYONYO – The month of love is around the corner and those who are still wondering how to make this year’s Valentine’s special for your loved ones, Speke Resort and Commonwealth Resort Munyonyo has eased it for you with their lovely offerings. 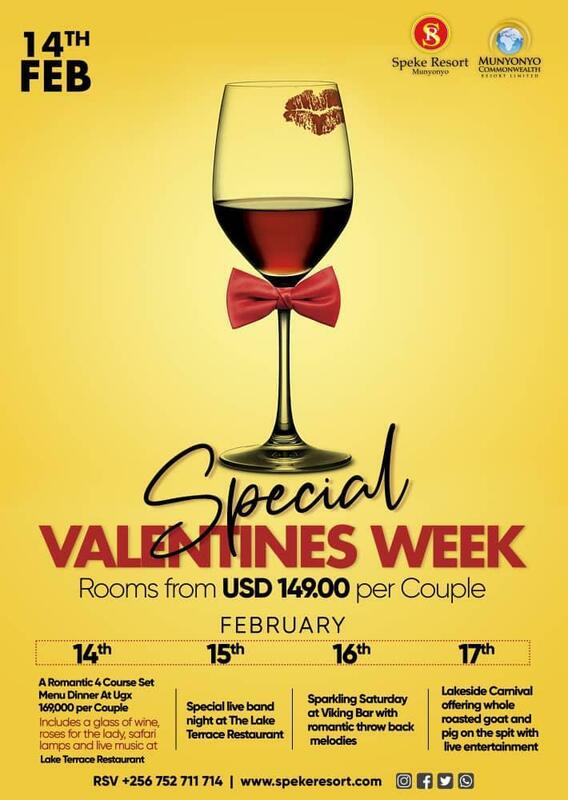 The lakeside five-star resort, which is a winner of several World Luxury Hotel Awards is offering a discounted 4-course set menu dinner on Valentine’s Day, February 14, at only Shs169,000 per couple. The dinner comes with a complimentary glass of wine, free roses for the lady and Live music at the Lake Terrace Restaurant. If you would love to spend the night, accommodation has also been discounted; starting from $149 (UGX549,000) per couple. This fee entitles you to a 30-minutes free boat road on Lake Victoria. However, you need to book the ride at the hotel reception. And since this year’s Valentine’s falls on Thursday, Munyonyo has organised an entire fun-filled weekend getaway for lovebirds. Friday, February 15 is a special live band night at the Lake Terrace Restaurant. February 16 is Sparkling Saturday at Viking Bar, featuring romantic throwback melodies while Sunday will be a Lakeside Carnival with whole roasted goat and pig on a spit with live entertainment.